Frame: 13 gauge steel, 1.66" in diameter, welded for durability unlike our competitors. Quality 10 oz vinyl pads that definitely stay in place - a spring goes through pocket at each end plus elastic tie-downs. 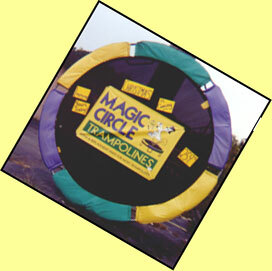 Color Choices -- 6 pads on round trampolines. All 1 color or choose 2 or 3.